The Cannibal Cards plot was devised by Lin Searles in the late 1950s and this decidedly unusual plot has been capturing the imaginations of card magicians ever since. The original Searles approach utilized special cards. 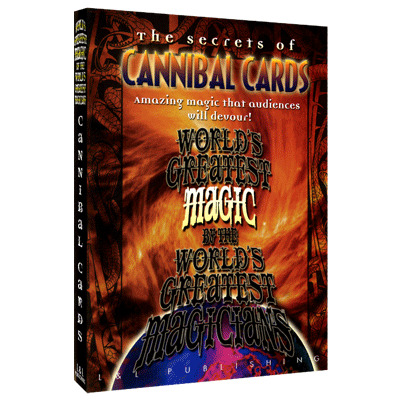 However, on this DVD, you'll see seven pasteboard masters, each with their own individual spins on this now-classic effect where a succession of playing cards seem to disappear when placed between other cards, apparently eaten by the "cannibal" cards - and all use ordinary cards. 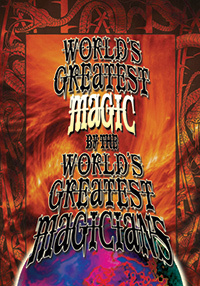 Michael Ammar begins with the classic plot combined with Frank Garcia's "Apex Aces" and a "collectors" finish that provides three minutes of solid entertainment, while Bill Malone follows with a typically hilarious presentation and a few red herrings thrown in that are guaranteed to even fool magicians. Juan Tamariz turns the trick into a piece of magical theater, complete with audience sing-alongs, while J. J. Sanvert follows the classic plot right up until his amazing surprise ending. Larry Jennings, as would be expected, offers a classic and elegant handling, while Michael Skinner demonstrates the version he used for over 25 years while he was the magician-in-residence at the Golden Nugget in Las Vegas. Finally, Eugene Burger presents a streamlined rendition that will, again, mystify everyone but particularly those who are familiar with the original, classic handling.